Climate change is responsible for destroying about 90% of coral found on the shallow reefs of the Chagos Archipelago say scientists in a new paper published by the Smithsonian Institution. The paper outlines findings from research conducted on coral bleaching and mortality in the Chagos Archipelago after two consecutive years of extreme sea temperatures. The Chagos Archipelago has been mostly uninhabited for 50 years, and is regarded as one of the best preserved and unpolluted sites for observing tropical marine life. Its coral reefs made a remarkable recovery after the previous warming event in 1998 but those near-pristine living atolls could now be doomed. "The shallow parts of all ocean facing and lagoon reefs of the northern atolls now look like nothing so much as a vast bone yard of skeletons," says Professor Charles Sheppard, lead author and one of the world's leading marine biologists who has been researching the reefs of the Chagos Archipelago for the past 35 years. "This disastrous scene extends down to about 15 metres in depth after which coral cover became more like a badly damaged coral reef but a reef at least.". Water temperatures across the Chagos Archipelago have risen by one third of a degree on ocean reefs and over one half of a degree in lagoons over the last two years, causing the recent severe mortality. Another author of the paper, Professor John Turner of Bangor University and CCT Trustee, has led international collaborative expeditions to the Chagos Archipelago funded by the DEFRA Darwin Initiative and the Bertarelli Programme in Marine Science over a number of years. 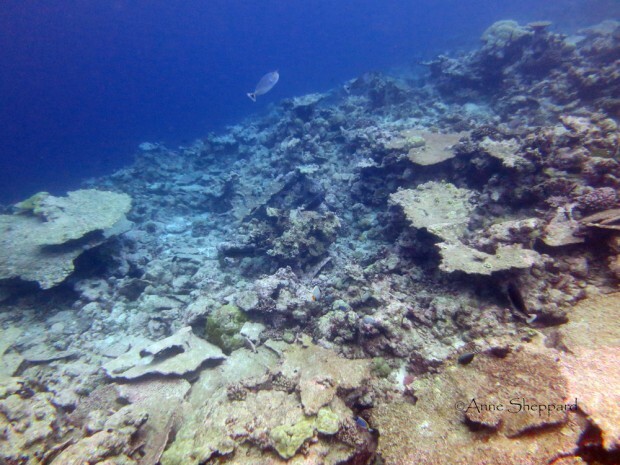 Data describing the onset of the recent coral bleaching event were collected during a pair of expeditions conducted by the Living Oceans Foundation. Sam Purkis, Chair and co-founder of the Chagos Conservation Trust US, participated in these and described the wholescale deterioration of the archipelago’s reefs, that occurred in a matter of days, as “utterly heartbreaking”. Prof Sheppard is expecting the disappearance of these reefs within the next decade. However, he points to one optimistic factor. "There are still huge schools of fish, and it was their presence that helped ensure the relatively fast recovery after 1998. So, there is some hope." But he admits a "prognosis is difficult. After 1998 the situation seemed dire, yet coral recovery was rapid because there were no local impacts to impede it. That may not be the case now, and worldwide action to fight climate change seems to be our main hope. ".